Key Lime Cake | Rosetta Bakes! Recently I bought two bags of limes and two bags of lemons; the plan was to slice them and put them in my water bottle to make the water look more refreshing to drink (I’m not a fan of water). The problem was, I put too much lime and too much lemon in the water; the water was so tart I could barely drink it. The next idea was to put less of each fruit in the water bottle; but it still tasted to tart for me. I then added Trivia (natural low cal sweetener)…and nope, no go! So, the next idea was to put fresh fruit in the water bottle. I put frozen strawberries and blueberries in the water and this worked for me. The only problem is…the strawberries end up getting very mushy, and that’s not appealing to me! lol I do think the fruit words better for me. If any of you have any ideas that I could use to make water more tasty (besides powders that you add to water), let me know…I would so love to hear your ideas! So, on with the over abundance of limes and lemons! I was not worried about using up the lemons because I have so many recipes that call for lemons…it was the limes I was a bit worried about. In all the things I’ve baked in the past, I could not recall a recipe that called for limes! It just so happened I was watching “The Food Network” (a tv channel that features assorted professional cooks who have their own show) when I saw Trisha Yearwood (a country singer married to Garth Brooks) making a cake using… LIMES!! 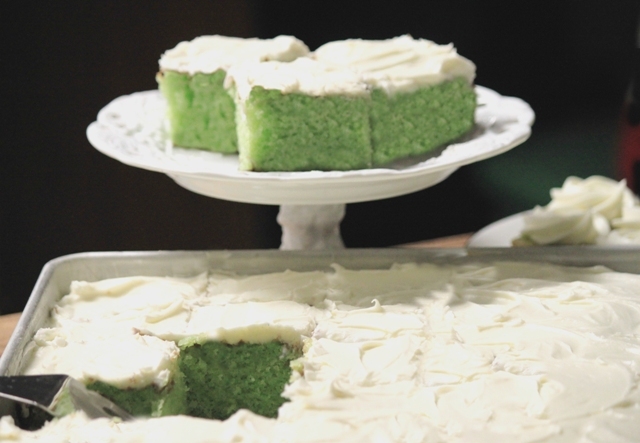 The cake she was making was called “Key Lime Cake.” I could hardly wait to make this cake…it sounded that good, and it also looked pretty easy to make. The only hard part was squeezing all those limes. The recipe calls for key limes, but limes work well also if you can not find key limes. I loved this cake so much, I did “not” feel the cake was less for using limes instead of key limes. I’m pretty sure the cake would have been much easier to make if I had an electric juicer; ours recently kicked the bucket as one might say! lol Definitely time to get another juicer! Ok, back to the cake! I can not say enough about how amazing this cake truly is. I think it ranks up there with several other cakes I find amazing. I’ll definitely be making this cake over and over again…that’s for sure. This cake bursts with sweetness but at the same time has that tangy tart taste…so much so my mouth is watering as I type thinking about this amazing cake. Trisha Yearwood said, this is a cake she takes to most of her family gatherings. It’s one of her most requested cakes…and I can certainly understand why. I hope you love this cake recipe as much as I do, it’s pretty amazing that’s for sure! Again, this cake calls for key limes, but if you don’t have them, use limes…it was amazing with limes. Next time I’ll make it with key limes to see what the difference is between the two. Thanks to Trisha Yearwood for sharing such an amazing cake! The cream cheese icing is optional. This cake is beautiful and tastes great with just the glaze poured over it. Key limes can be hard to find. Substitute regular lime juice for Key lime juice without sacrificing flavor. Here is the same cake as a baby shower cake! Thank you pudbakes, this is a pretty amazing cake! Rosetta try putting cinnamon sticks in the water…it looks like a brown stick. Not sure what you mean Donna…cinnamon sticks in water? Yum, what to try this.